I find that many writers who come to us for editing services are in a hurry. They may have spent months or even years writing a book and then want us to edit it in two weeks. Not all our clients–but some. I can understand that. When they added that last period after the last sentence, they were done! Ready to get it out there to share with the world. Wrong. It’s not ready. 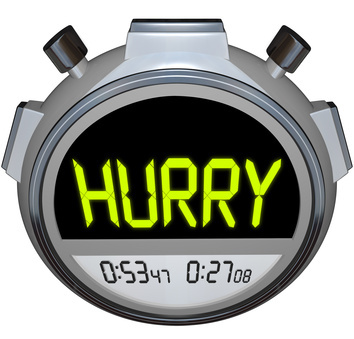 Have you ever experienced that urgency to finish up quickly? I urge you to slow down. Your story is told or message written but now it needs to be polished. You don’t want any choppy sentences, overwriting, weak transitions, or inconsistencies to distract the reader from your message. Are there any word choices that could be better? Are you focusing on the message you want to convey or are you taking side trips? These are things we all do. Even the most experienced authors. While you write the book, you live it. But of course, your focus is on what you want to say–not the grammar or sentence structure or whatever. But that’s okay. That’s what we are here for. New eyes with a fresh perspective can make such a difference. We don’t want to change your message. We don’t want to alter your style. We want to make what you have written shine. And that takes time. When we do a comprehensive edit for you, we first do a content edit, checking flow and development and that sort of issue. We stay in contact with you and get your constant input. When we complete that–together–the line edit begins. Sometimes the content editor will also do the line editing. Sometimes a different editor will. The line editor will check all the nuts and bolts: grammar, choice of word, consistency, and more. And then your manuscript moves on to the proofreader–another person on our team. One with an eagle eye who can find any errors left behind. (Most of them, anyway. We count on you to do a last read as well. The more eyes the better.) And all this takes time. Slow down. Let’s take time to finish this off right. You and your book deserve it! ← Do It in Style! Excellent advice! There is nothing more embarrassing than finding mistakes or awkward phrases in published material.